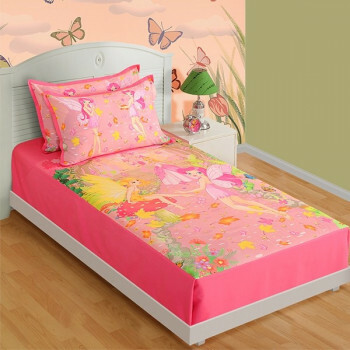 Take your kid into the world of fairies as your kid sleep into this gorgeously designed fairy bed sheet. 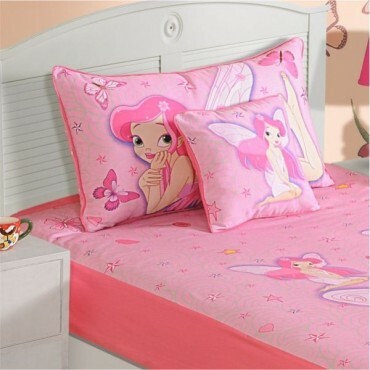 A mesmerizing pink fairy with shiny wings: who wouldn’t want to own this? 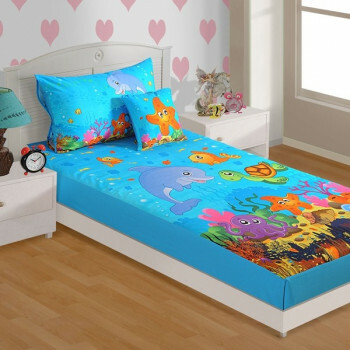 Our bed sheet is made of pure cotton and just as your kid will enjoy the fairy, so will your kid enjoy the skin friendly fabric of this bed sheet. Everyone should start their day with a fresh mood and end it in a happy tone too. 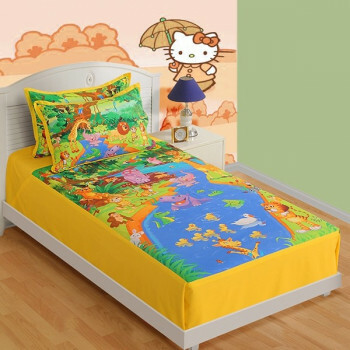 This is why we have designed a bed sheet set that is fully fun and refreshing, a jungle bed sheet. 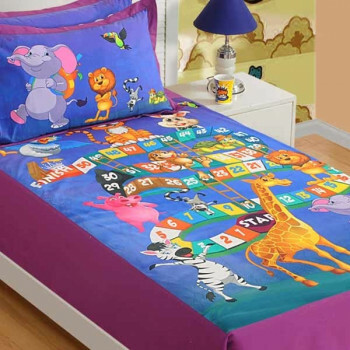 The bed sheet is fully covered in the images of animals, all so adorable and staring at you. 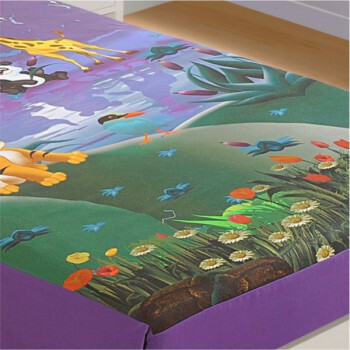 True to the name of our product, our design team has created a bed sheet that looks almost real and mesmerizing as a perfectly moonlit night. 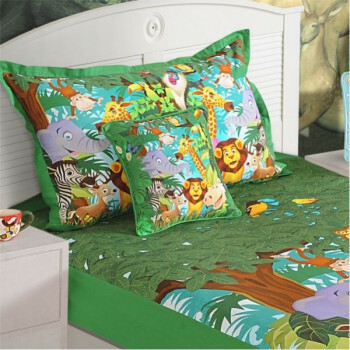 The tiger cub, the adorable panda and the cute giraffe are a great sight too. 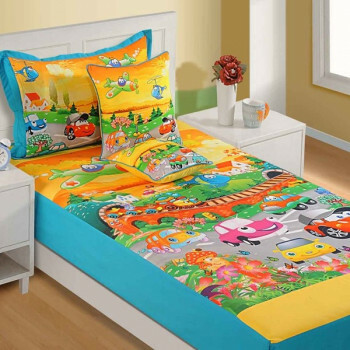 One thing is for sure, your kid will have a good night sleep as serene as these image on the bed sheet. 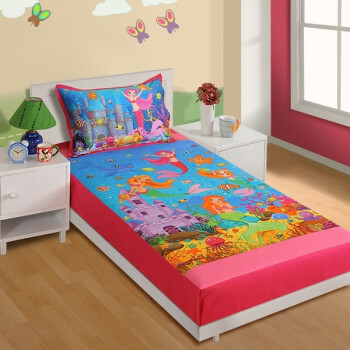 Set up a colorful environment of fantasy in your kid’s room and watch him get excited by the fascinating marine life. 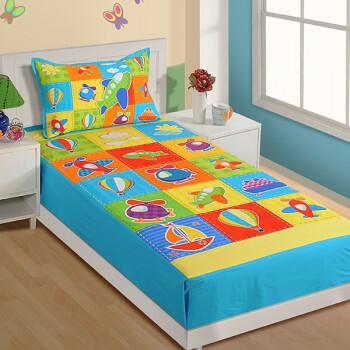 Change the appearance of his room by filling it up with elegant designs and blissful colors. 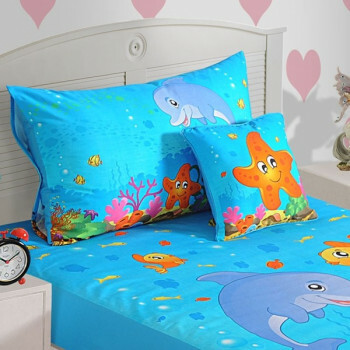 The attractive cartoon designs of starfish, dolphins and fishes will certainly give your child an underwater adventure. Every child wants to enter a world full of fairies and beautiful creature. 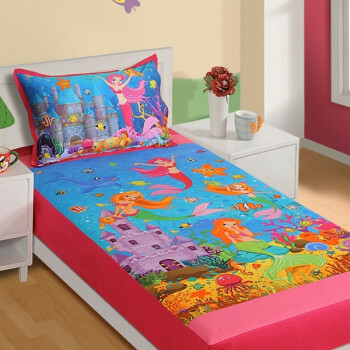 All their imagination can come true with this marvelous and colorful bed sheets. 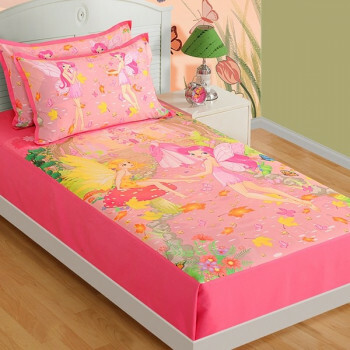 These bed sheets have beautiful printed fairies over them which reflect a cheerful appearance. 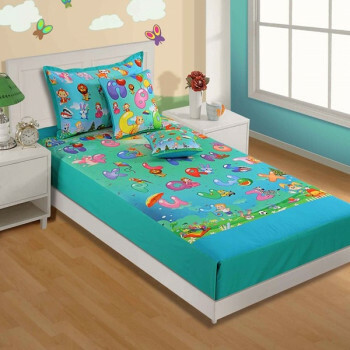 If keeping your kid happy is your top priority then keeping you satisfied with our product is our aim! 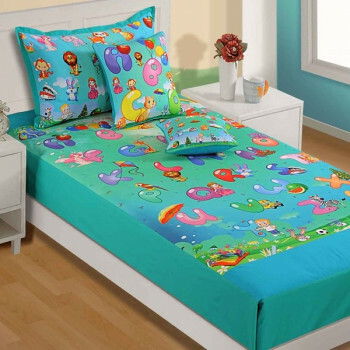 Swayam India has designed comfortable cotton bed sheets for kids which are all digitally printed wholly with attractive graphics. 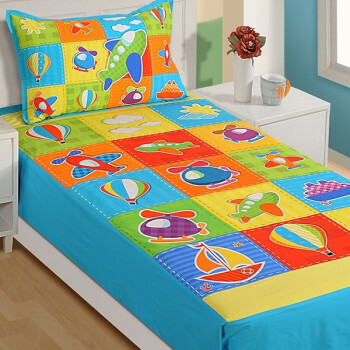 Let’s complement your kid’s room with our colorful and merry bed sheet and spruce up the ambiance. 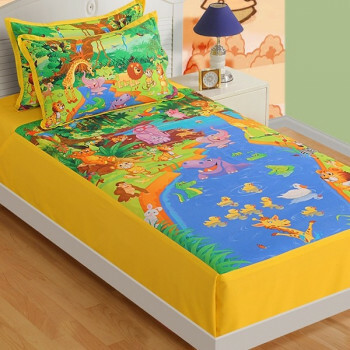 Using the images of fairies, teddy bears and animals, our product are worth every penny you spent as your kid will never let go of our bed sheet. 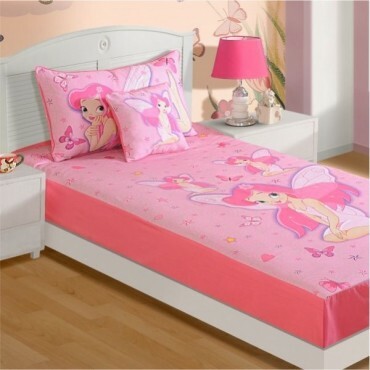 If your little darling believes in fairy tales our pink fairy bed sheet will be the perfect choice. 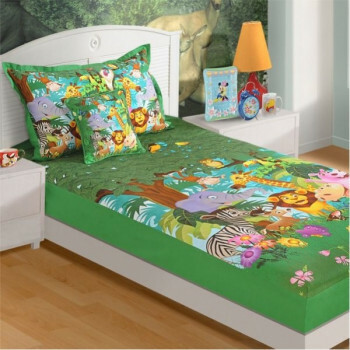 Or if your prince prefers the animal kingdom of the jungle book, then our jungle bed sheet will be the right pick. 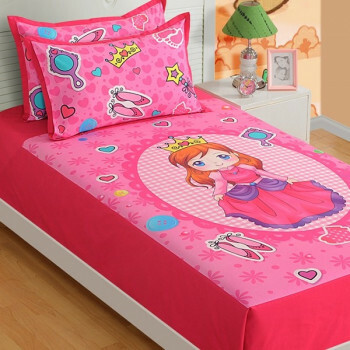 Yes, we also have the customization for our bed sheets so that you can always get the right one of your choice. 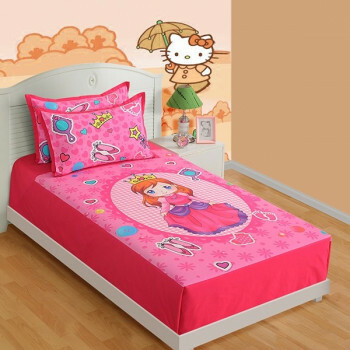 With matching pillow and cushion covers for the bed sheets, you can check out more of our products from our online selling portal Swayamindia.com 24x7. 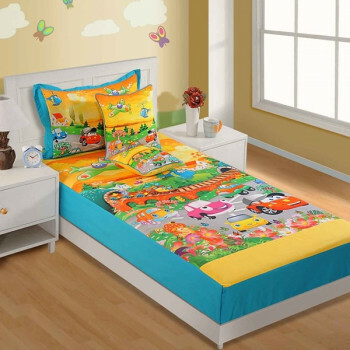 Gift your kid a sleep of sweet dreams and your log on to our online store for a hassle free shopping.